The typical kickers are not considered athletes or football players but simply as kickers. Usually, kickers just kick and don’t do anything else. Well, that is not the case for the very talented Briggs Bourgeois from St. Amant High School. Bourgeois is not just your average kicker. He is also a very good wide receiver. As a kicker, Bourgeois is no slouch. Last year, as a junior, Bourgeois was 15-19 in field goal attempts including a 51 yard field goal that he made in a game. Bourgeois has a good leg as his longest kick in practice was actually an impressive 63 yards. As a wide receiver, he is just as impressive. Last season, he had over 60 receptions for 1,000 yards and 17 touchdowns proving that he is one of Hayden Mallory‘s favorite targets. As of right now, Bourgeois is committed to the Southern Miss Golden Eagles. The Eagles will hope to hang on to Bourgeois as he is one of a kind as a kicker and as a punter. In the preseason, he was named to our 1st Team All-Louisiana team as a Kicker/Punter. Louisiana Football Magazine Editor and T.V. Host Lee Brecheen has high praise for Bourgeois and the many talents that he can bring to a college team. The St. Amant Gators are having a great season as the team is currently 8-1 with a close loss to Catholic High (B.R.) which is currently having an undefeated season. The Gators will try to finish the regular season against Dutchtown on a high note before playing in the postseason next week. We caught up with the do it all star player from St. Amant as he talked about this year, his commitment to Southern Miss, his quarterback, and so much more in today’s recruiting spotlight. LAFM: What is your name, age, position (s), and school you play for? LAFM: You are committed to play for the Southern Miss Golden Eagles. What is it about the school and the football team that drew your attention and made you want to commit to that school? I have been to Southern Miss a few times and every time I have been there, it just feels like home. All the people and coaches are really nice. It reminds me of my hometown. Everyone knows everyone. LAFM: You are both a kicker and wide receiver. Which position do you enjoy playing more and want to play more at the college level? I enjoy playing wide receiver because I like to have the ball in my hands, but I also enjoy kicking. It’s a great feeling knowing that you can help your defense out by making the opponent defense drive down the field and not have a short porch. LAFM: Usually, kickers are described as guys who are not athletic but you are the exception to the rule as you play wide receiver and other sports like baseball and soccer. Does your athleticism really set you apart from the other kickers in the state? I do believe that my athleticism sets me apart from other kickers in the state because not only can I kick, I can also go down and cover if the coaches need me to. LAFM: Is Southern Miss also recruiting you to play wide receiver as well? They have not said anything to me about it. LAFM: What were your stats and accomplishments last season? LAFM: What are your current stats for this season? 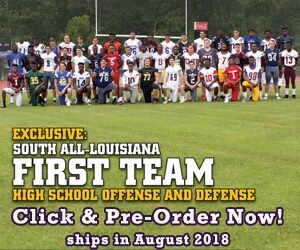 LAFM: You were named to our 1st team All-Louisiana team as a kicker. What does it mean to you to be recognized as one of the best players in a state that is loaded with great football players? It feels great to be named 1st Team All-Louisiana as a kicker because I have been working hard since my freshman year to perfect my craft at kicking and all that hard work has paid off. LAFM: Let’s talk about the team. Last year, the Gators went 9-3 and made the playoffs. It seems that this year’s team has taken that next step. Right now, the team is 8-1 and could have easily been 9-0. Was this kind of improvement of a great season last year expected for this year? Last year, we had a great season and that team broke down the door for this year’s team. Our theme this year is “Reach Higher” so we have been working hard during the off-season and in-season to really prove ourselves this year. We have a lot of guys with experience from last year so we are looking forward to use that to our advantage. LAFM: The team has one of the best QB-WR duos in the Baton Rouge area with you at wide receiver and Hayden Mallory at QB. What is your relationship with him on and off the field? Hayden and I are best friends. It helps when you are good friends with your QB because he knows the cuts I am going to make so the ball can be on time and accurate. LAFM: What were your individual goals heading into the season and have you lived up to those goals? I had a lot of goals this season, and I have lived up to those goals. LAFM: The team is 8-1 but the team had a tough loss against Catholic High two weeks ago. How frustrating it was for the team to have a big lead at halftime and not finish the deal in the second half? It was a frustrating loss but we are not going to let that define our season. There is a lot of football left to be played. LAFM: Is there any particular team that you want to play in the playoffs personally? There is no particular team that I would like to play in the playoffs. My strength as a football player are knowing our scheme pretty good so that allows the coaches to do different things with me. LAFM: What are some areas to your game that you can improve on? Some areas of the game that I could improve on are learning to be a better student of the game and sitting back and watching. LAFM: Is there a college or NFL player that you model your game after? If so, who and why? If I had to pick a NFL player, I would pick Justin Tucker (Baltimore Ravens Kicker) because he is very business like when he kicks. LAFM: Is there anybody that you like to thank for putting you in the position that you are in today? I would like to thank my parents for everything they have done for me. Whether it was taking me all over for kicking camps to just being there to talk so I am very blessed to have them in my life to put me in a position to succeed. Previous: LAFM TV 11th Season! Episode 8!